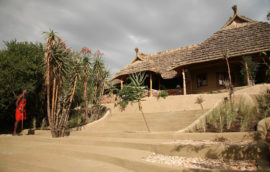 Basecamp Masai Mara is located at Koiyaki group Ranch just outside the Masai Mara National Reserve close to the Talek Gate. 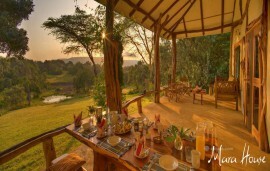 It is distinctly designed for eco guests, naturalists and photographers as it offers a great view and intimate safari experience as it is surrounded by lush trees, thickets and shrubs that blend in well with the area landscape. 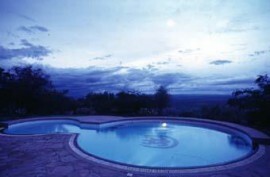 Basecamp Masai Mara has 12 spacious and exquisite tents hidden away on a peninsula on Talek River offering a breathtaking view of the savannah. 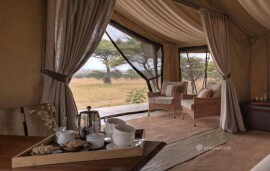 The tents have open air ensuite bathrooms and individual balconies that offer a beautiful view of the river. Guests enjoy game drives, nature walks, hot air balloon and interaction with the Maasai women as they weave and do beadwork. The Family Riverside Tent is the perfect choice for larger groups, or for families travelling with children. The tent has two separate wings, each featuring a double bed with a shared bathroom area. Our Family Riverside Tent offers a larger deluxe balcony to give families or groups a chance to socialize in complete privacy.